Out this week, Wednesday Jan 16th in US, Jan 17th in the UK, is issue #4 of Transformers Devastation, which continues the expansion of the IDW/TF-verse (and how!). At the end of last issue, the Autobots (a bit waterlogged, but otherwise undamaged after the crash landing/detonation of Ark-19 in the Gulf of Mexico) rose to challenge the Decepticons’ living weapon Sixshot (and save Ratchet from a messy end to boot). But the question remains, can even seven Autobots (one of whom is the mighty Optimus Prime) prevail against a one-bot weapon of mass destruction (with no less than six alt. modes) like Sixshot? And what’s more, can they really expect their ‘secret’ war to remain a secret for much longer? The answer to the first question is ‘wait and see.’ The answer to the second question is ‘no.’ This is where it all hits the fan… big-time! Expect a full on battle royal, plus more Headmasters, more Hunter, a cameo appearance from the headliner in a recent Spotlight, Reapers aaand Starscream!!! Story is by me, drawings by guest artist Robby Musso (who does a simply outstanding job filling in for EJ, who’s back next issue). Cover (click on the image below) is by EJ Su. 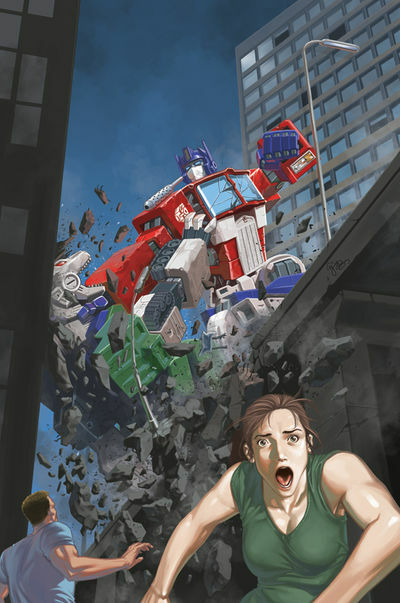 For more information on all IDW’s Transformers titles go here. This entry was posted on Monday, January 14th, 2008 at 5:11 pm and is filed under Uncategorized. You can follow any responses to this entry through the RSS 2.0 feed. You can leave a response, or trackback from your own site. I have a question. You’ve said that you under any circumstances don’t want to include primus and unicron in IDW-verse. So imagine my shock when read Megatron: Origin #4 which mentioned primus on page 8 and 22. I know that Eric Holmes did the script so I wonder if it was a mistake made by him or do you plan to include primus in IDW-verse after all? I just started reading the whole devastation issues and the parts before them. Amazing. Why not have some toys made of these stories. Headmaster figures, mini human figures, amazing story line also. Keep up the great work. Just a message to say love the stories (and the art fantastic), but dont know about the headmasters, as much as they are cool it just seems that things are going to quick and as long as you dont kill Prime and bring in Rodimus (or the stupid pretenders) i will be a happy camper. Geat job on the storyline so far. Every week this comic seems to sell out at the local comic store so you guys gotta be doing something right. The intoduction of Sixshot is freaking awesome, and the fact that you guys actually develope his character and personal history is something not was not done enough in the past. EXCELENT work!!! please bring more odd transformers into play, Maybe Omega Supreme vs Predicon??? Thanks for all the positive feedback on Devastation. I’m having a real blast writing it. STJ21… no current plans for the Protectobots, but I’m sure they (or at least the individual characters) will appear at some point. Azurek… just because someone refers to something called Primus, doesn’t necessarily mean it’s G1 Primus. There are still no plans to do feature Primus (as was). But is/was there someone or something called Primus in the IDW/TF-verse, quite possibly. David… I have no foreseeable plans to bring in Rodimus. Pretenders, however, already exist in the IDW/TF-verse (see Stormbringer). Excellent stuff, yet again. I liked how the bots got their served. With all the hype around Sixshot, I was hoping it wouldn’t be a cope out. Good to see that their plan from the top was to run away as quickly as possible. Also good that Prime was having serious trouble, if not losing. Again, glad that the surprise ending was not leaked. Oh and although you hinted at Soundwave and Starscream, it was nice to see Ravage and Laserbeak as well. My only gripe would be if maybe next time we didn’t have the “good goddamn”…that just felt like a little too much for me and a little forced (just the way it rubbed me, others may have no problem at all). Otherwise another good issue and I eagerly look forward to #5.